Unleash your organization’s full potential by breaking down data silos to connect crews on vessels, employees spread across departments, partners, agents, and even legacy systems. Integrate warehouses, suppliers, your fleet and colleagues seamlessly into your daily processes. Capture all observations on your tablet or smartphone in an easy and comfortable way. Cloud Fleet Manager is the web-based all-in-one software solution for shipping companies. The system offers a single, cloud-based source of truth for all employees as well as the crews at sea and external partners, centralizing all information and drastically reducing the effort for data exchange. The cloud-based design of the application gives you the freedom to use it anytime, anywhere and browser-independent. Even on your smartphone you always have access to the most important information. Cloud Fleet Manager offers tailor-made applications for all different departments of the company and increases collaboration, streamlines processes and can be used intuitively. Use Cloud Fleet Manager at any time and any place due to the cloud-based application. Receive the most important information and a current overview on your smartphone. The solution is completed by a variety of high-performance apps. With the Cloud Ship Manager as an offline application you even handle tasks that require an interaction between land and sea. Cloud Fleet Manager provides apps that directly integrate the actions of your crew into the processes of your fleet. An intelligent synchronisation mechanism provides full transparency. 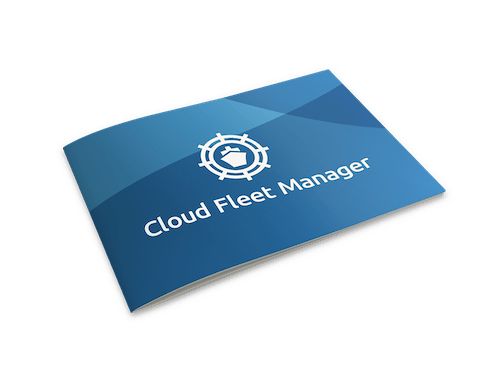 Cloud Fleet Manager combines all important information in one place. Your own apps and external applications serve as sources and can be connected to our public interface. Do you have your own software development department? Expand your system and integrate it into your infrastructure. Let Cloud Fleet Manager continuously and automatically exchange data with other services and products you already use. Automation of data exchange eliminates manual transfer errors, and by compressing all information in a central place, you gain more visibility and a more solid view of your business. Have your fleet's position and scheduling information imported from third-party systems such as Fleet Tracker, Stratum Five, Telemar LocPoint, Transas, TerraMar Networks, and Purple Finder PoleStar. If you use the services of MARLOW or C Teleport, you can integrate them. Take over statistics, such as e.g. open jobs and counter readings from the planned maintenance systems (PMS) of DNVGL and MESPAS. Automatically exchange information about purchase inquiries from ShipServ or integrate Kuehne & Nagel into your warehouse management. Transfer key figures from the ERP solutions Microsoft Dynamics NAV (Navision) or NAVIDO. Integrate your DATEV or SAP based accounting. Cloud Fleet Manager offers a variety of proprietary documented interfaces that you and your agencies and partners can use. As a result, you can export or import data such as agent information, crew lists, employee data, KPIs or inspection findings from Cloud Fleet Manager in a fully automated manner. When switching from another system, we will, if desired, initially import your existing data from external systems. In the past, we have already successfully imported databases of Amos, AVECS, BASS, Buss-Data, DNVGL and Omega products. One of the key benefits of Cloud Fleet Manager is that we offer it as a SaaS solution. This means that there is no up-front fee and you only pay for the modules that you ordered. This way you can simply adjust the services or features on demand when you need them. For instance, we bill on a monthly basis. You sold one of your vessels? Simply delete it from the system and your costs for the next month decrease. Added two vessels to your fleet? Just activate the modules needed in the system and you are good to go. You always have full control over your expenses – no need to worry about over- or under-provisioning of licences. You always only pay for what you really use. Intranet solution for modern shipping companies. Keep an eye on your vessels’ charter. Boost efficiency by flexible crewing processes. Highly collaborative service request management. Inspections with a beneficial impact on your business. MRV & IMO DCS compliance made easy. OPEX always under control with real-time budgeting. Stay on top of things. Visualise your whole fleet. In order to survive, stay competitive and thrive in challenging times, shipping companies need to implement smarter, faster and more effective processes. Today’s technology revolution shows the way. Learn in depth what Cloud Fleet Manager has to offer and how the cloud-based approach helps shipping companies to accelerate business results, improve internal processes and stimulate innovation. By means of Cloud Fleet Manager we could organize internal structures more efficient, reduce effort for communication and transfer of data and are enthused about the constant development and expansion of the system. We couldn’t have made a better choice than choosing Cloud Fleet Manager for the management of our fleet. With a fleet of 41 vessels, it is indispensable that all ships are in a technically perfect condition at all times and can react quickly to observations. Thanks to the Inspection Report we could not only digitize the whole inspection process – carrying it out on the smartphone or tablet - but also achieve a significant increase in efficiency and collaboration. Are you unleashing the full potential of your data? Using KPIs will give you the crucial edge on your competition. We are very happy to welcome seven new customers - adding more than 70 new vessels to Cloud Fleet Manager. Meet us at the Marina Bay Sands, April 9 - 11 to get your live demo of Cloud Fleet Manager at booth B2-C01.